By Melissa Lennig on July 2, 2018 Leave a Comment. This content contains affiliate links. As an Amazon Associate I earn from qualifying purchases. Kids of all ages will enjoy creating the creepiest green creepers around! 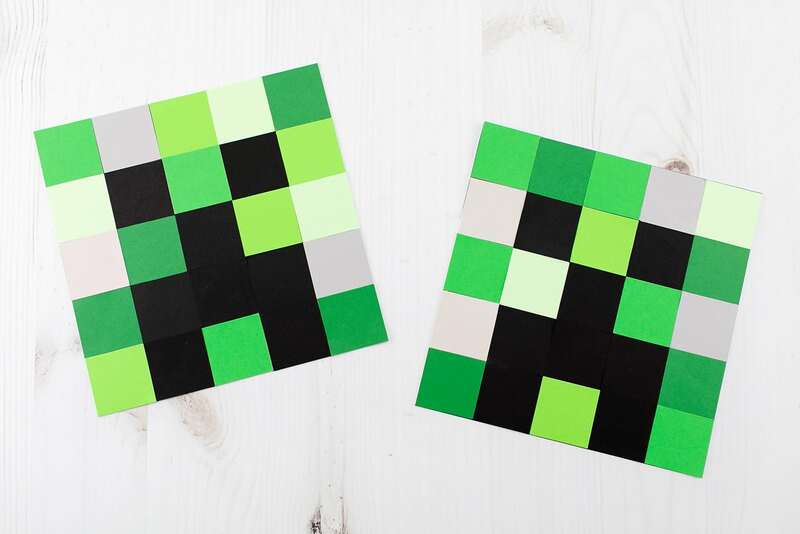 This easy creeper craft is perfect for home, camp, school, and Minecraft clubs. 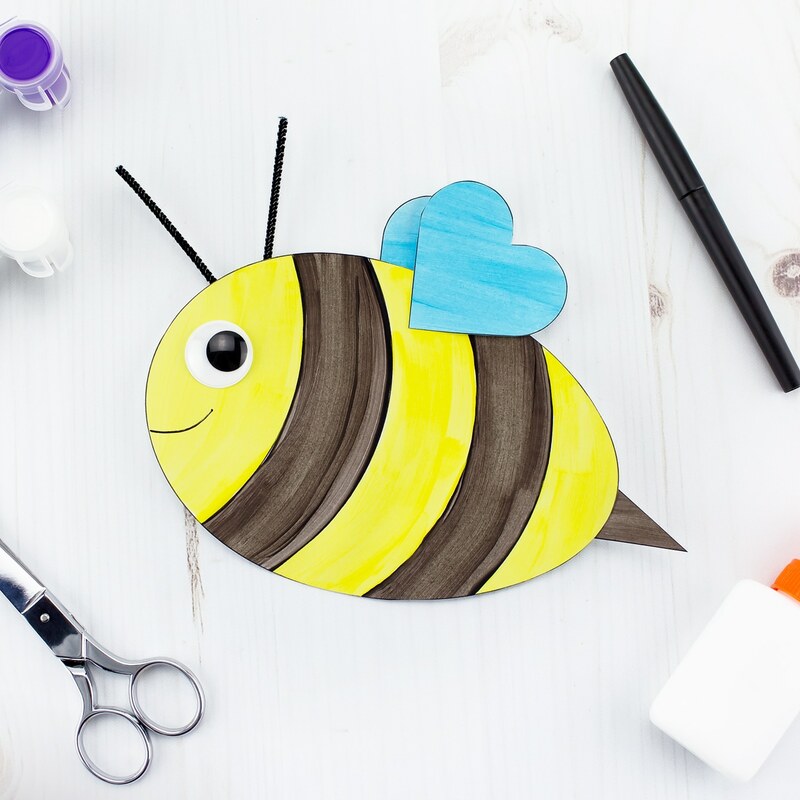 Featuring basic craft supplies, parents and caregivers are fans of this low-prep Minecraft craft too. My boys look forward to their Minecraft time each day. They love to connect their devices to “play in each other’s worlds” and build together. It’s fun to hear them laugh, strategize, and learn! After all, some experts agree that Minecraft makes learning fun, boosts perception and creativity, and improves hand-eye coordination (source). 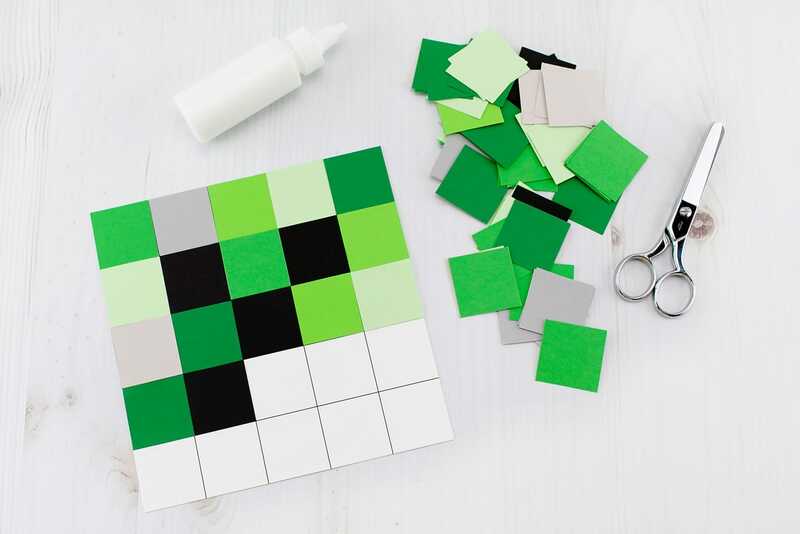 When tech-time is over, kids will enjoy using squares of green, grey, and black construction paper to create sneaky creepers in all sizes. 1. 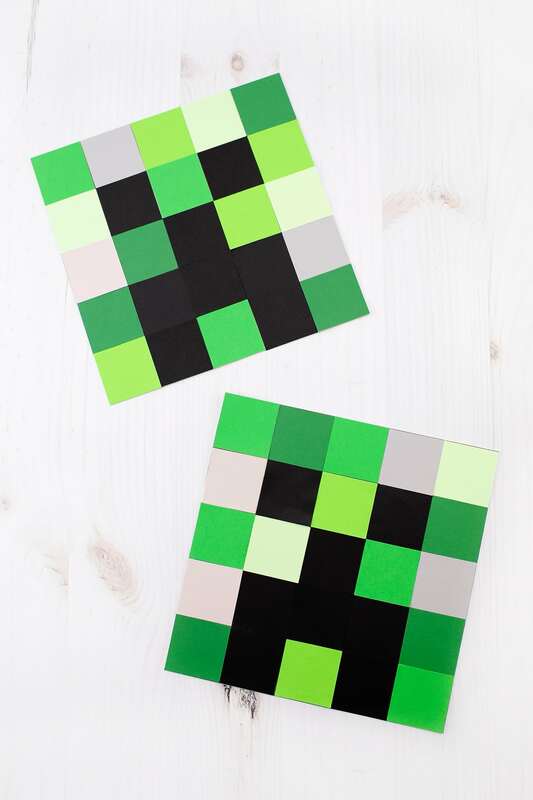 Print and cut out the creeper template. We trimmed ours with a paper cutter, but kids can just use scissors. 2. 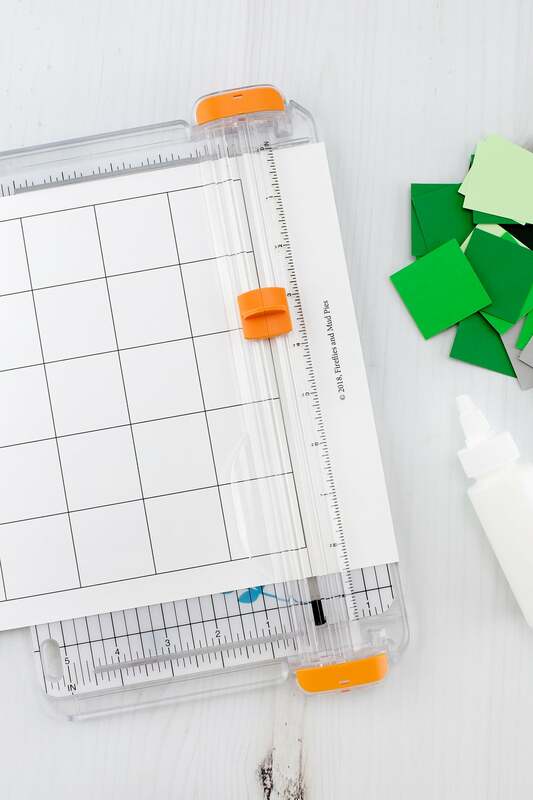 Use the paper punch to cut out a large pile of squares. 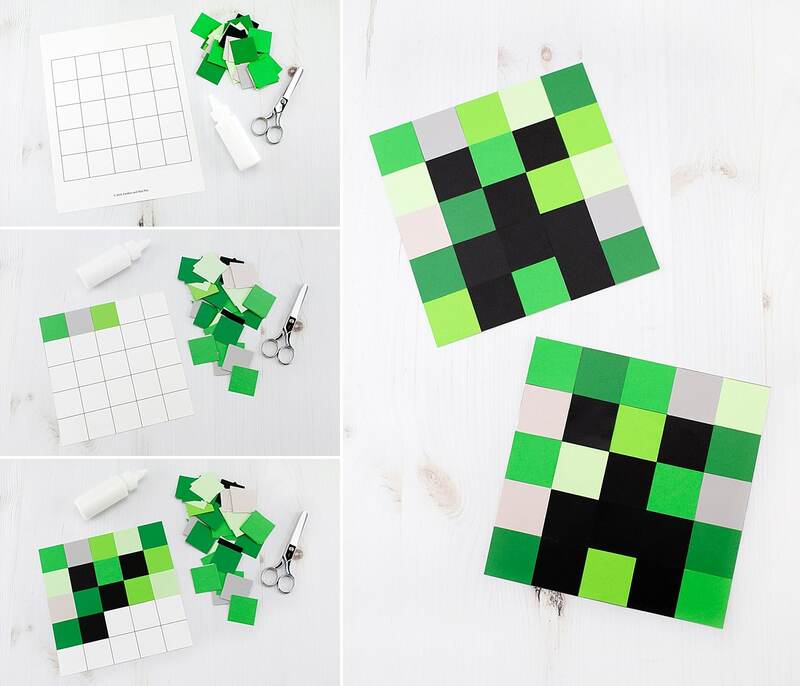 Use a variety of colors so your child can give their creeper a classic pixelated look. 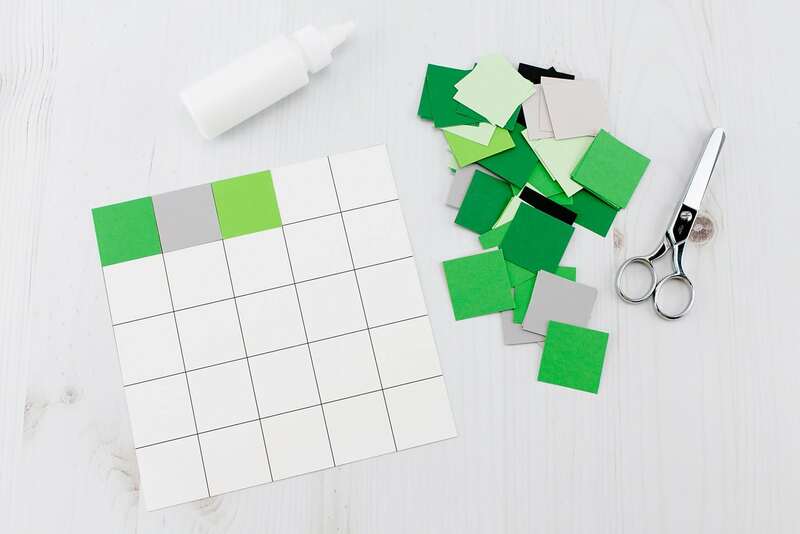 Your child will need 8 black squares and 17 green and gray squares. 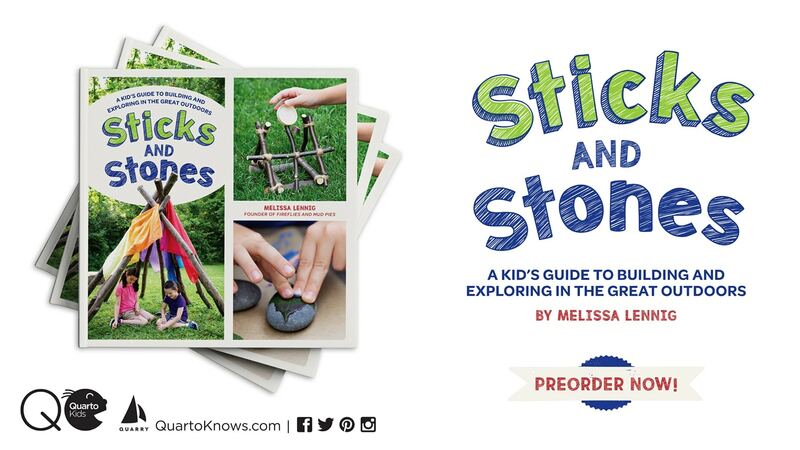 Alternatively, kids can simply paint or color their squares. 4. Invite your child to design their creeper. 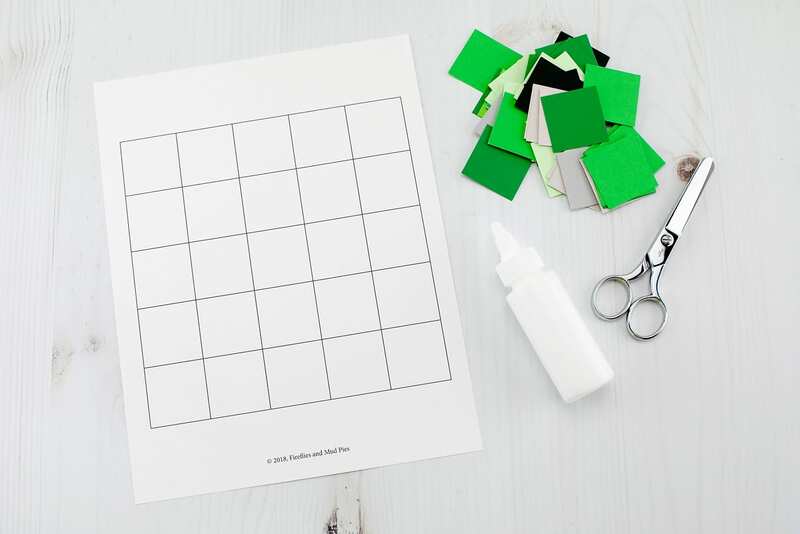 Invite your child to cut about 10 more pieces of paper to size (use page 2 of our template), then staple them behind the creeper to create a one-of-a-kind book for your child to write all of their Minecraft strategies and ideas in! Simply make the craft as directed above, then cut out page 2 of our template. 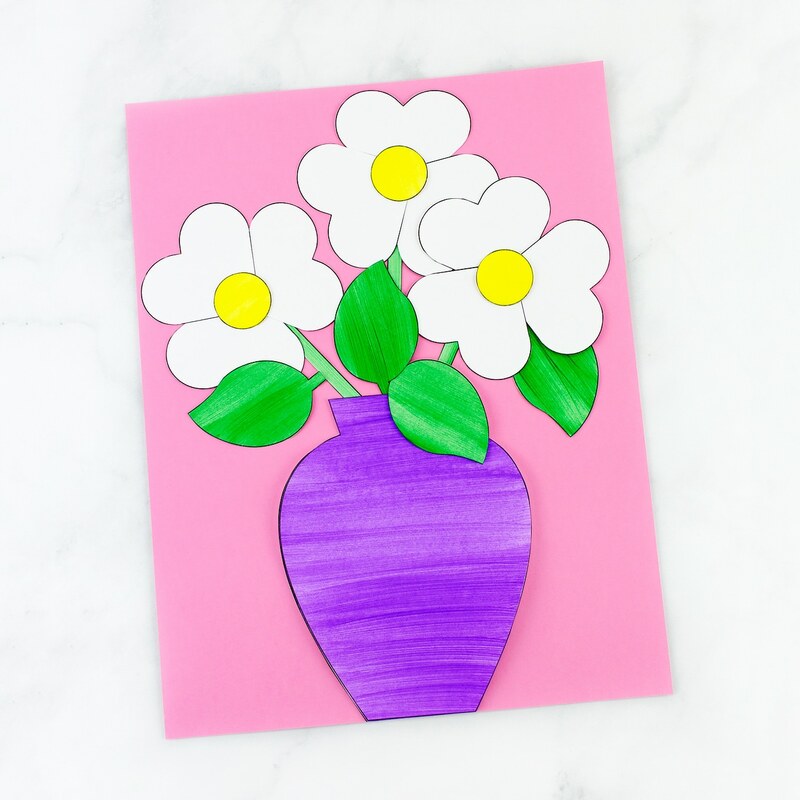 Glue the blank page to the back of the creeper, then write inside of the card. 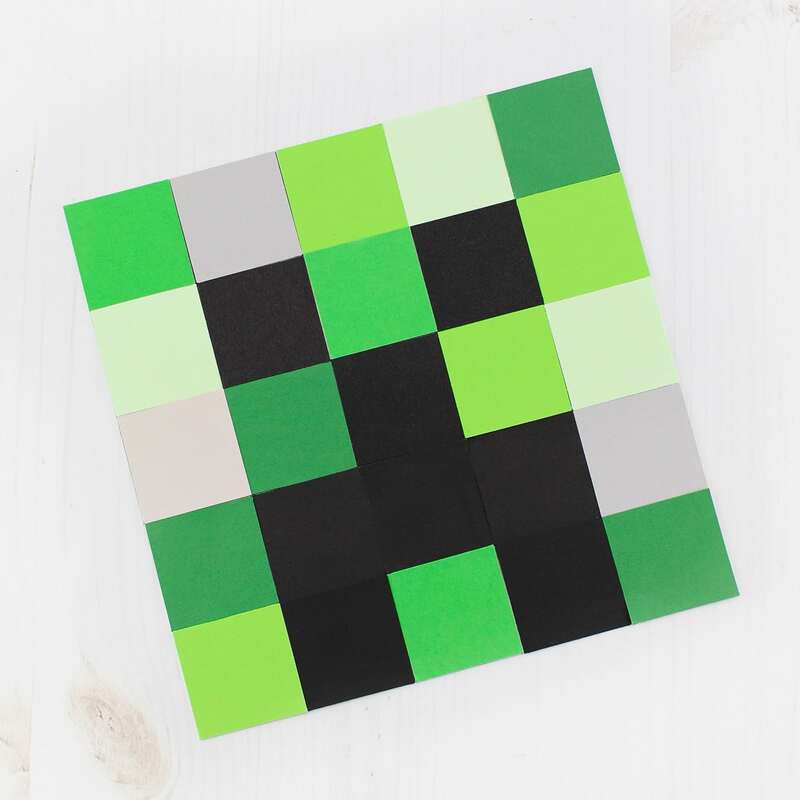 To make a Minecraft mask, invite your child to glue or tape a wide craft stick to the back of their creeper craft. If desired, help your child cut out the creeper’s eyes. When the mask is complete, kids can hold the mask up to their face for play. Kids can use page 3 of our template to color their favorite Minecraft characters like sheep, pigs, skeletons, villagers, and Steve! 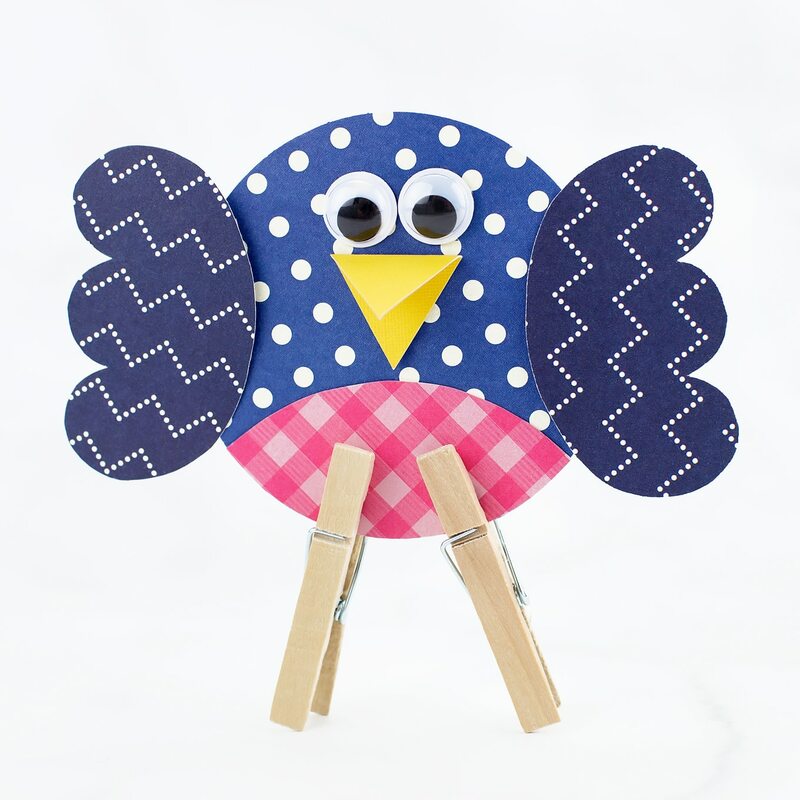 Click the images below to view more easy paper crafts for kids.